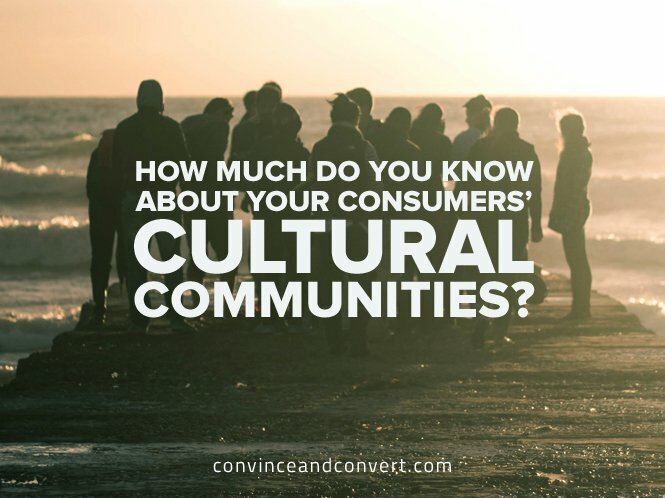 How Much Do You Know About Your Consumers' Cultural Communities? How Much Do You Know About Your Consumers’ Cultural Communities? Social media engagement and community building is such an important piece of growing consumer advocacy. Humanizing your brand by adding a voice helps consumers relate to you. But what about you relating to them? How do you understand who your consumers are beyond basic demographic data? One way to identify and engage your consumers is through hashtags. Starting on Twitter, hashtags have been used since 2007 to make conversations about similar topics or events easy to find and participate in. While this is still true, hashtags are now used to provide context and add emotion to conversation as well. When limited to a certain number of characters, hashtags and emojis give your Tweet, Instagram, or Facebook post emotion, just like using inflection to convey emotion in conversation. When done right, hashtags sharpen your message and help communicate your voice. A list of hashtags should not exceed the length of the post. Only use hashtags related to the post. Pointless #midsentence hashtags #make it hard to read. Keep ‘em short! #longhashtagsarehardtoread (especially when you use all lowercase). As marketers, hashtags are a very powerful way to connect with and relate to our customers. You can create hashtags for consumers to use, or you can adopt the hashtags your consumers are already using. It’s important to keep in mind that even though multiple people are using the same hashtag, they may be using it for different reasons. As a brand, you don’t want to jump on a hashtag without understanding the context behind it. In extreme cases, we’ve seen some serious brand blunders when attempting to hijack trending hashtags. To ensure that you don’t fall on a list of “epic brand blunders,” and to make sure you are resonating and reaching your ideal audience, you need to understand who is using these hashtags. 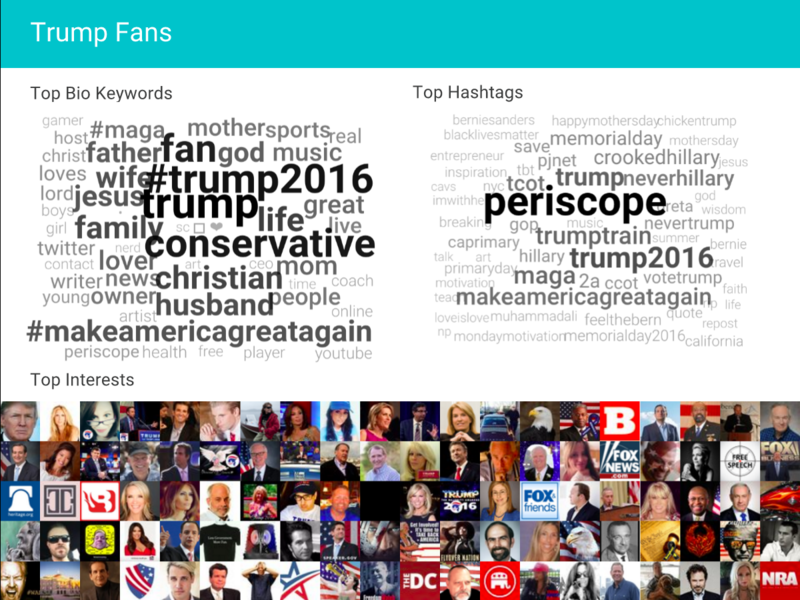 For an example of how context can vary (even with a popular hashtag), let’s put ourselves in Periscope’s shoes. There are many different cultural communities who use Periscope’s live streaming service. To understand who these communities are, I ran an Affinio analysis on #Periscope in the USA. 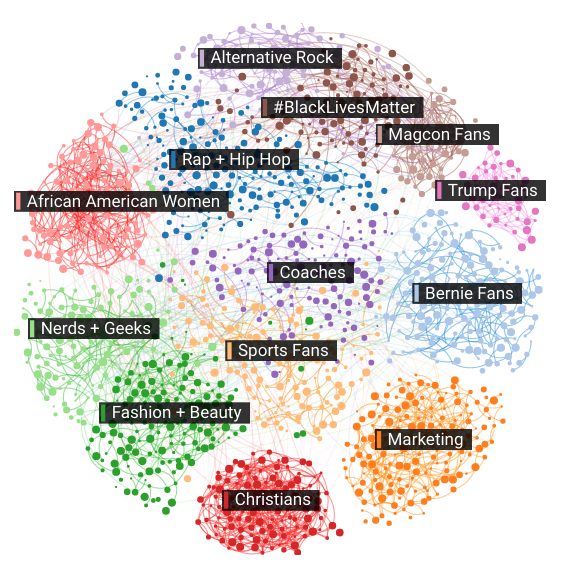 Affinio’s powerful algorithm ingests anyone who has mentioned the hashtag within the last 30 days, then groups individuals into communities of people with shared interests. Cultures change, and it’s important to continually update your analysis and understanding of who your consumers are. Let’s explore some of the communities further to understand how you might relate to each one. As you can see by looking at the top interests (or contextually relevant accounts) of this community, many of them are related to Donald Trump, Christian Conservative leaders, political commentators, and media sources. Many of the hashtags are related to the Trump campaign. Within the community, people are even self-describing in their bio as #trump2016. These are devout Trump supporters. If you’re not a young millennial, there’s a good chance you have no idea who the Magcon Boys are. It’s okay—neither did I. The Magcon Boys are a group of young guys who became famous on Vine and now tour around the world performing for large crowds of young people. Looking at their top interests, you can see the members of the Magcon family include Cameron Dallas, Nash Grier, Carter Reynolds, Jack Johnson, Shawn Mendes, and others. 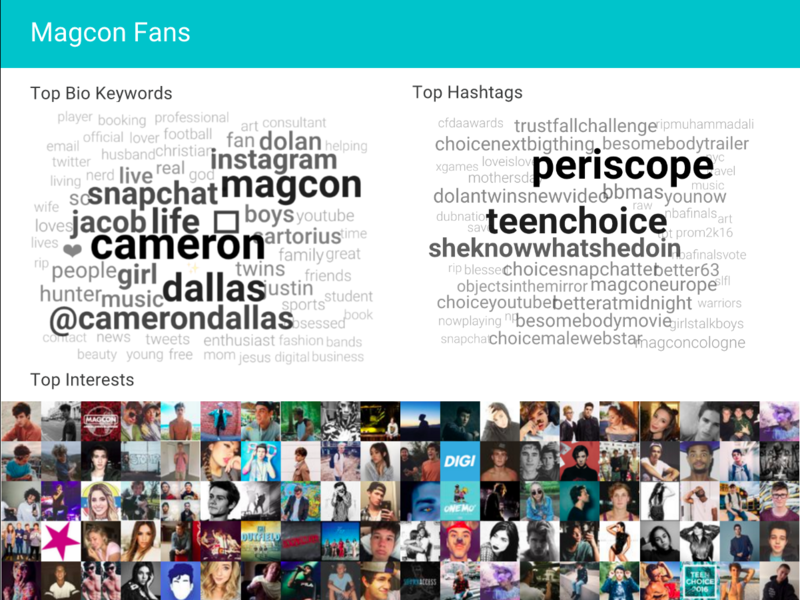 These are die-hard fans who self-describe as their favorite Magcon member and vote for them in the #TeenChoice awards. As a Community Manager at Periscope, you can now dive further into each of these communities to learn more about the cultures and how you can better relate to them. This allows you to guide the conversation, create content that resonates, and ultimately, build meaningful relationships with these culture-based communities. Consumers today want to feel a connection with the brand they purchase from. Relating to them in the context of culture and interests will help you build these connections at scale.